Over the past few weeks, we’ve been sharing our framework for thinking through the path forward for traditional health systems, as they look to drive value for consumers. 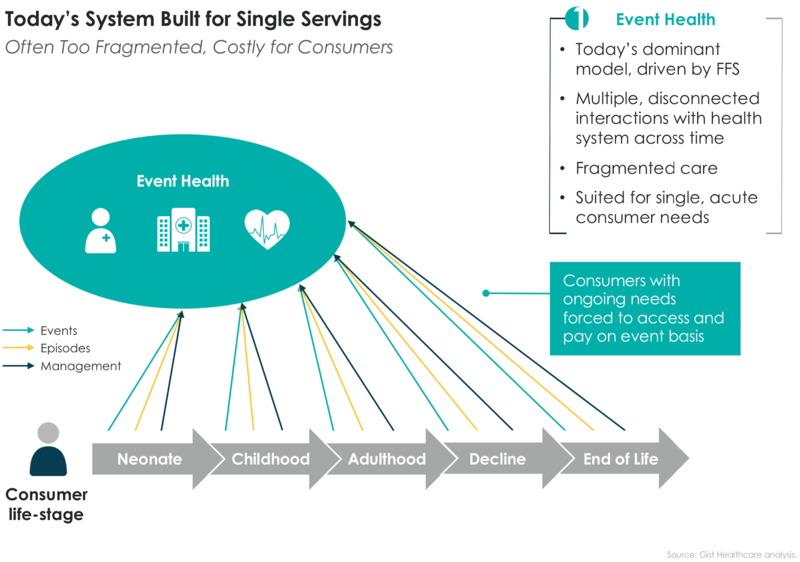 We began by describing today’s typical health system as “Event Health”, built around a fee-for-service model of delivering discrete, single-serve interactions with patients. We then proposed the concept of “Episode Health”, which would ask the health system to play a coordinating role, curating and managing a range of care interactions to address broader episodic needs. 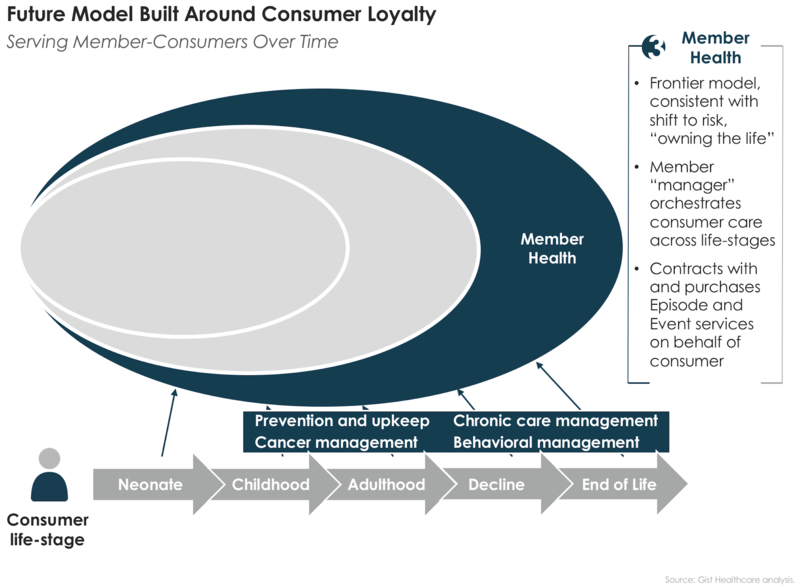 Finally, last week we shared our vision for “Member Health”, in which the system would re-orient around the goal of building long-term, loyalty-based relationships with consumers, helping them manage health over time. 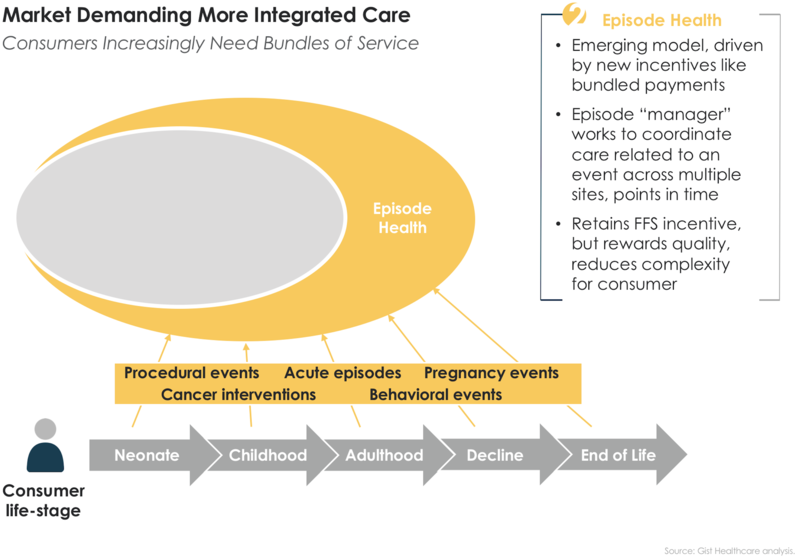 In this broader conception, the health system would curate a network of providers of episodes, and events within those episodes, and ensure that the consumer (and their information) moves seamlessly across a panoply of care interactions over time. This week we bring those three, distinct visions for the role of the health system together in one framework, shown below. A couple of points are worth mentioning here. To begin, our view is that health systems face a fundamental choice over the near term: either begin to embrace the broader aspiration of evolving toward Episode Health and Member Health or become reconciled to the reality of a future as a subcontractor of events and being part of some other organization’s curated network. There’s nothing wrong with being a subcontractor, as long as your cost and quality positions allow you to win business and thrive. You might be the best acute care hospital choice in the market, or the most efficient surgery provider, or the best diagnostic center. But competition will be intense among those subcontractors and earning the business of those who coordinate episodes and control referrals will be increasingly demanding. Most health systems have already begun to look beyond Event Health, investing in strategies that allow them to span the full continuum of care. Other systems have pushed even further, into the “risk business”—looking to become Member Health and take on the role of managing a consumer’s care across time. But contrary to common wisdom, this evolution does not require a binary choice. Systems are not moving “from one canoe to the other”; rather, most successful systems will play a combination of all three roles at the same time, in perpetuity. While it’s always worth evaluating whether others might be more efficient providers of some Event Health services (diagnostics, rehab, and so forth), most systems will want to maintain a robust base of providing Event Health, even as they embrace a more comprehensive role. Finally, there is a space we describe as “Beyond Health”, which comprises all of the additional components of consumer value delivery which may be beyond the ability of most systems to handle on their own. Most notably, these include services that address many of the social determinants of health—housing, nutrition, transportation, and the like. Our recommendation is that health systems look to partner with other organizations at a local and national level to address issues that, however critical, lie beyond their ability to fully solve on their own. 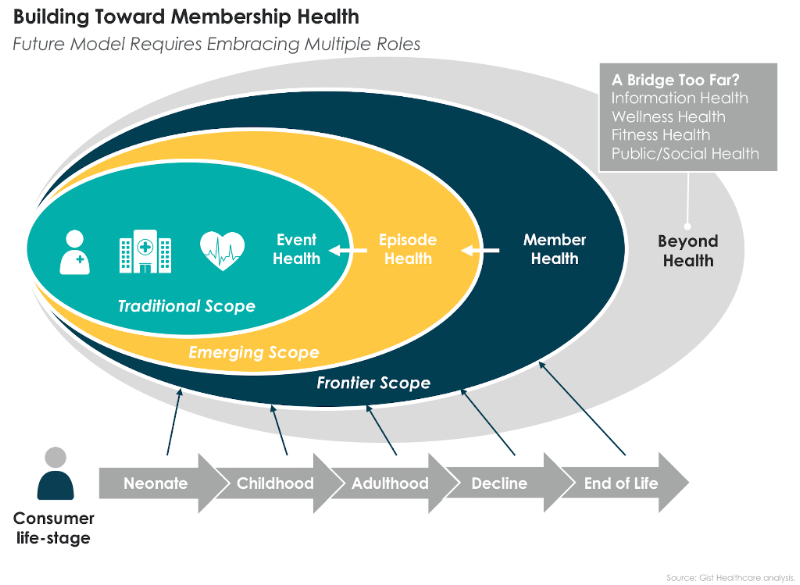 Next week we’ll begin to share some additional implications of our Event-Episode-Member Health framework and discuss the operational challenges that face health systems looking to make this evolution.